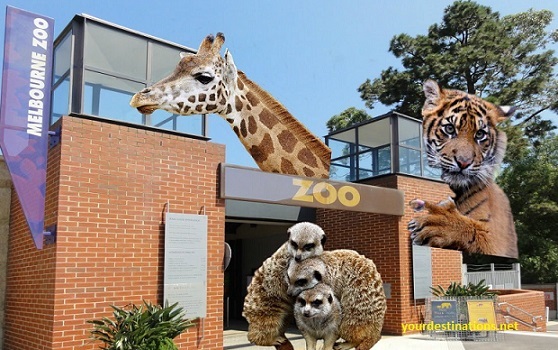 Are not you curious to visit the oldest zoo in Australia? Yes, this time we want to take you to a tourist spot in Melbourne that contains the animals of various species. Zoo area of 22 hectares was already opened since 1862, you know. There are about 350 species of animals in this Melbourne Zoo. In addition to sightseeing animals, you can also relax in the park or picnic area at this zoo. Melbourne Zoo addressed at Elliott Ave, Parkville VIC 3052, Australia. Who is not interested in traveling to the theme park? While in Melbourne, you can visit Luna Park, which is a playground that never deserted visitors. Investigate a calibration, it turns out this playground was already opened since 1912. Although Luna Park is a fairly old playground, its managers continue to innovate adding new rides as the times progress. In addition, the rides at Luna Park are also well maintained. The interesting rides that you can try while in Luna Park are Coney Island Top Drop, Pharaohs Curse, The Great Scenic Railway, and some other rides games. Located east of the City of Melbourne, Yarra Valley is known as a winery that became a favorite tourist destination for tourists. The Yarra Valley is in the Yarra River valley area. Tourists who come here usually follow the tour agro in the vineyard or taste directly wine that has been packaged in the form of wine. Besides, the attraction of the Yarra Valley does not end there. You can also ride a hot air balloon managed by Global Ballooning Australia. From the top of the hot air balloon, you can enjoy the scenery of the very distinctive green hills of Yarra Valley. This one in Melbourne is home to over 10,000 animals. Not only that, in Sea Life Melbourne Aquarium you can see the largest saltwater crocodile. You can invite the children to come to this aquarium and see the life of the creatures that inhabit the Southern Ocean. In addition, penguins are animals that are the main attraction for Sea Life Melbourne Aquarium. You will walk down the aisle that is the side and top of it is the sea animals that are engrossed in swimming. Visiting the Sea Life Melbourne Aquarium will provide a real experience in seeing sea creatures up close. Market If you like shopping, then you should not miss the Queen Victoria Market. This neatly arranged traditional market is on Elizabeth Street, located in the center of Melbourne City. The goods sold in this market include foodstuffs, clothing, jewelry, until the typical Melbourne souvenir that you can make souvenirs. The price of goods sold on the Queen Victoria Market is of course much cheaper if you buy goods at the mall. Queen Victoria Market is open daily, except Mondays and Wednesdays. Tours do not always have to visit fun places of entertainment. Once in a while, you can do spiritual tours by visiting places of worship with a unique building form or an interesting past history. In Melbourne, there is St. Paul's Cathedral is a church with gothic architecture and has been around since 1835. This church has the highest peak tower in the world. Neither Christians nor non-Christians are permitted to enter and walk around the church as long as there is no worship. In addition, in this church, there is also a Cathedral Shop that sells various kinds of souvenir or spiritual goods at an affordable price. From downtown Melbourne, you have to travel overland as far as 11 KM just to get to Brighton Beach. This beach is actually a bay located in Port Philip Bay. Given this beach is near the city center, then the facilities around the coast fairly modern. You can find yacht clubs, boutiques, cafes and cinemas around the beach. One thing that makes Brighton Beach look interesting is the existence of wooden houses which is a beach house with colorful paint to attract tourists. The largest and oldest museum in Australia is a tourist attraction in Melbourne which we will discuss next. National Gallery of Victoria was already built since 1861. Located in St. Petersburg. Kilda Road, Southbank, this museum is divided into 2 different buildings, namely NGV International displaying a collection of international art objects and Victorian Heritage Register. In addition, Ian Potter Center is devoted to displaying distinctive Australian art that has for many years. Ranges mountains are to the east of Melbourne City. This one mountain is classified as low because of the top of the mountain just 633 meters above sea level. The hills and valleys that are around these mountains are a favorite spot for tourists. The reason, not infrequently we will find trees that belong to a rare species. If you want to be closer to nature, then just come to this Dandenong Ranges.